Have we been adjusting the TPS wrong all these years ??? I'll prefix this with "I am not a mechanic" and only have gathered the info below from reading it off different forum sites, however it does make sense to me. 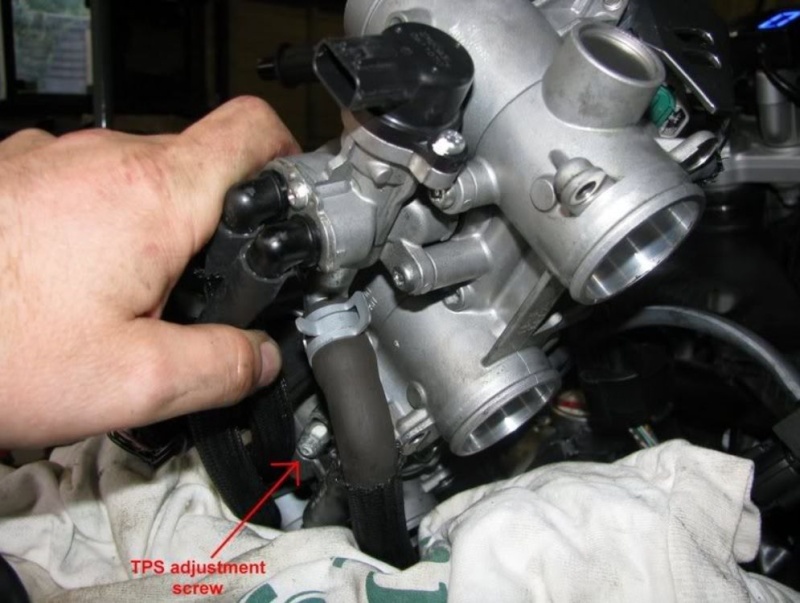 I remember reading on the TWT site that this adjusting the sensor assembly on the side of the throttle bodies is in fact not the correct TPS adjustment, it is actually not setting the TPS at all, and in fact could be causing more problems than if you had not touched it at all. 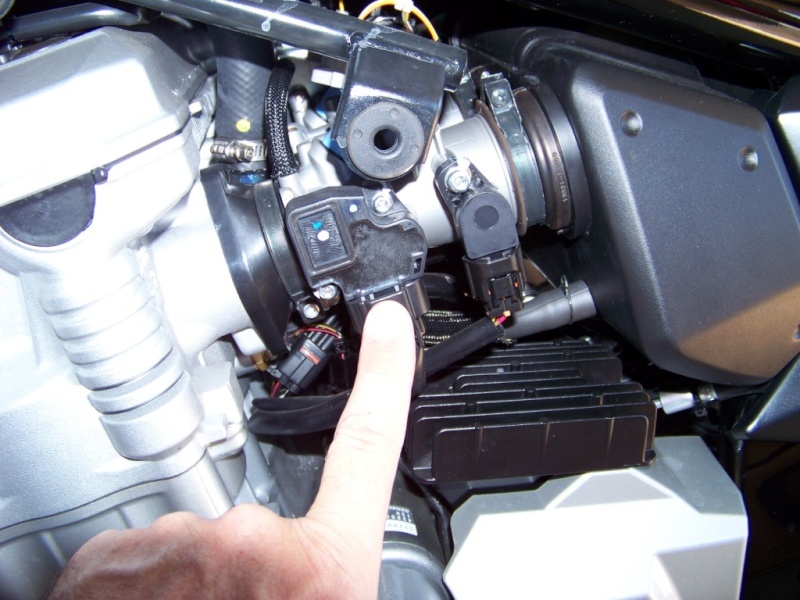 The theory is that the sensor is not suppose to move, it is the throttle shaft that you want in the correct position. Sort of makes sense, if the sensor is saying the shaft is out, i.e. _C00 or ¯ C00, by moving the sensor to ─C00 we are just setting a false reading as the throttle shaft has not actually been moved. But by leaving the sensor in it's factory set position and adjusting the shafts position you can get the true middle line reading. 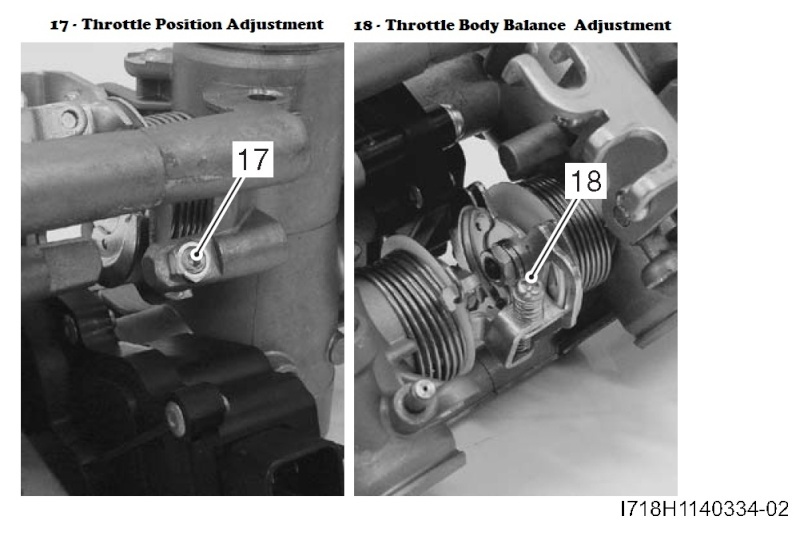 The actual TPS adjustment (item 17 below) is a real biatch of a screw in the middle between and under the two throtlle bodies, and the adjustment can only be done properly with the bodies of the bike. 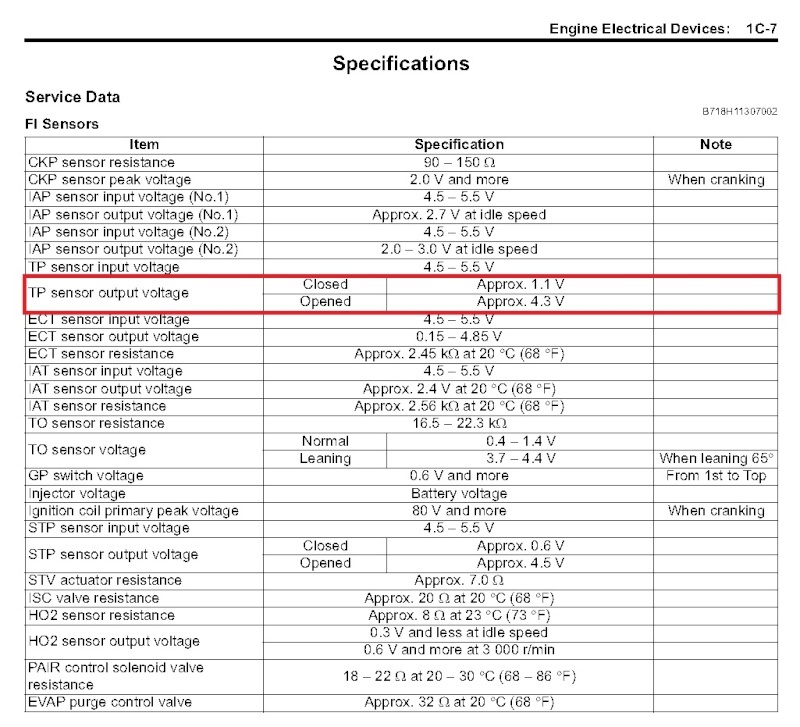 Some have said that item 17 is the idle adjustment screw, however the manual itself states the idle adustment is an ECU parameter, not a manual adjustment. Beware there is another screw adjustment (item 18) above this one that is shown, that is for balancing the two throttle bodies and should not be touched as it is set by the factory. So, with a lot of our members having set their TPS readings by moving the sensor body, has it been done it wrong ??? Set it to coo- and buy a fuel controller and get it tuned professionally. Fuel injection is meant to be easy, trying to fudge it by moving sensors etc is going to get you into hot water. Do it properly. @reddog wrote: Set it to coo- and buy a fuel controller and get it tuned professionally. Fuel injection is meant to be easy, trying to fudge it by moving sensors etc is going to get you into hot water. Do it properly. Having thought about it a bit more the method of moving the sensor module can be justified but only if the throttle is fully closed. Once the ECU knows the position of the throttle shaft via the TP sensor voltage it can do its thing and pulse the injectors accordingly. However, if this sensor information is not properly aligned with the butterfly positions then the ECU would be thinking the air intake is at one level when in reality it was something else. So, as long as the throttle shaft has all the butterflies completely shut, then the TP Sensor should read ─C00, if it doesn't then a small adjustment of the sensor body should bring things into alignment. However if the shaft is not fully closed then the screw adjustor (item 17 above) would need to be made and more than likely a realignment of the sensor body as well. @barry_mcki wrote: Having thought about it a bit more the method of moving the sensor module can be justified but only if the throttle is fully closed. Once the ECU knows the position of the throttle shaft via the TP sensor voltage it can do its thing and pulse the injectors accordingly. However, if this sensor information is not properly aligned with the butterfly positions then the ECU would be thinking the air intake is at one level when in reality it was something else. Seriously good post Barry, I'm trotting straight off to the Texans to catch up. Are you checking the TPS when at operating temp, just asking because on other bikes I have done this is standard procedure as stated by the workshop manual. Case in point is my SV650 (which I'm now selling), when cold it reads _C00 yet when warm reads -C00 and thats when I adjust it, and yes you do move the sensor and not the throttle blades via the throttle stop screw.